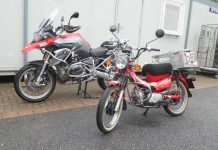 Bikes such as the Suzuki Burgman are in many ways perfect for travelling on. 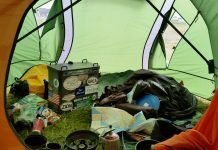 They have excellent luggage capacity, good weather protection and are practical and versatile in a way that even proper ‘adventure’ bikes are not. The solution of course is an adventure scooter. It’s a wonder no one thought of it sooner…. The X-ADV is actually a proper motorcycle. The fact that it is chain driven (rather than belt) and has the engine up at the front means that it doesn’t qualify as a scooter, and fundamentally is nothing more than a NC750, reimagined to look like a scooter, with the X-ADV itself based on the Integra that Honda started out their hybrid moto-scooter experiments with. So the engine is the same 745cc parallel twin as in the NC750 range, given an extra 500rpm rev range in order to give it a sportier ride, and fitted with the latest fourth generation dual clutch transmission gearbox (DCT). Much else is new on the bike. There’s a new cast aluminium swingarm, tubeless spoked rims (17-inch front, 15-inch rear) fitted with Bridgestone Trail Wing tyres, as well as a new headlight and fairing design that go some way to justifying the fact that this DCT equipped X-ADV is nigh on £2500 more than an equally engined NC750. £9599 is the damage. It’s a serious amount of money and reinforces the notion that Honda doesn’t see the X-ADV as a volume seller in the way that the NC750 is, but instead a niche, low volume machine that was born out of the curious minds of Honda engineers who thought that building an Integra that could ride the rough trails down to the local beach was a good idea. It kind of looks the part, but with the engine mounted up front as it would be in the NC750, it isn’t half awkward to get on. The first thing about the X-ADV is how difficult it is to get on. I’m 5’10 but really struggled to get my leg up and over, mainly because of what is quite a tall wide seat, rising from the 790mm of the Integra to a new height of 820mm, with ground clearance also increasing from 135mm to a more lofty 162mm. You can’t step-through it either as the engine and black and easily scuffed cowling are in the way. You have to approach it like a normal bike and even then I couldn’t find a way to get on it cleanly, especially with the top box fitted. It’s a bit of a shame as you’d think that the main market for this kind of bike is the older rider struggling to get on a big bike and seeing something like the X-ADV as an alternative. Otherwise the X-ADV doesn’t feel as heavy as its wet weight figure of 238 kilos would suggest. It feels light and manoeuvrable in a way that an equally weighted Africa Twin or GS might not. There are some nice touches to it as well. The screen adjustment mechanism works well and is simply enough to use, though does at times require two hands. The keyless ignition – whilst not for me as I prefer the simplicity of a key – is a nice nod towards modern functionality, with an ignition dial in the centre of the console turning the bike to on, or off, or to the position which allows you to toggle open either the fuel flap or underseat storage latch by means of a rather flimsy plastic rocker switch. Under the seat the 21-litre storage area has just enough room for a non-peaked helmet, as well as a 12v socket and an interior light in order to illuminate your luggage. It’s not as practical as a big scooter, but it is more practical than a typical motorcycle. A glovebox up in the front cowling would have been handy. 12v charge point under the seat is handy for charging electronics on the move. Just enough room under there for a full face non peaked helmet. It is put to shame by the double helmet space of the Burgman’s under seat storage. The X-ADV is a DCT six-speed gearbox only, with no manual option available. This is now fourth generation DCT and it does feel smoother than the bikes I’ve ridden in the past with DCT. On the right switchgear you control the bike from Neutral, to Drive to Sport. Sport holds the gears longer and downshifts earlier. In either of these modes the bike is working as a full automatic and does a good job of it, with often imperceptible changes (though does sometimes leave you in the wrong gear when cornering). On the right switchgear there’s also a toggle to flick the bike into manual mode. This brings into play the forefinger and thumb operated buttons on the left switchgear; the forefinger to go up a gear (where the headlight flash would usually be), the thumb to go down a gear. 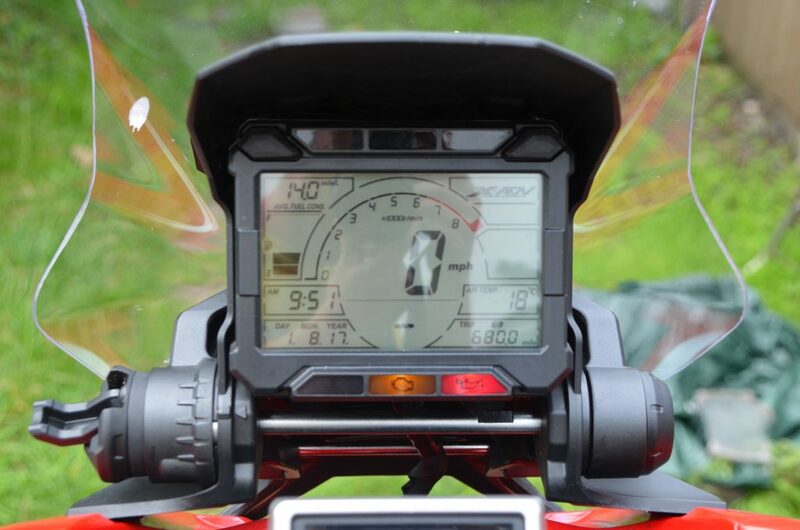 Once selected, the bike remains under manual operation, over-ridden only when you decelerate and don’t change down, at which point the system will automatically drop the gears with the engine revs. You can also bring the manual gear change buttons into play at any time, over-riding both Drive or Sport mode, the auto system kicking back in after approximately 10 seconds. This was how I preferred to ride the bike; Drive mode, full auto, and if needed the manual toggles to override the bike’s brain to change up or down, and then allow auto to kick back in again. It’s a good system. 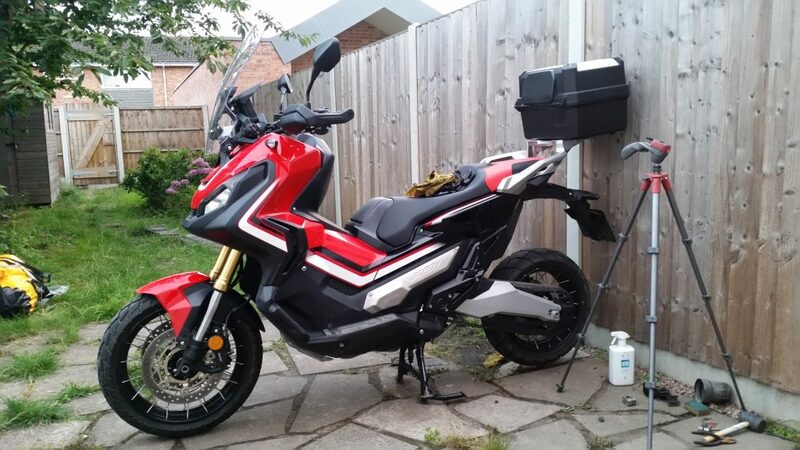 It suits the X-ADV in a way that for me DCT doesn’t suit the Africa Twin. On a big tall adventure bike I prefer a good old fashioned clutch and gear lever, but on the X-ADV it works well as a twist-and-go. The only niggle is Sport mode. All this does is hold onto gears longer than in Drive and the nature of the low-revving parallel-twin engine means that it makes more noise but not necessarily more speed as most of the surge has gone by 4250rpm. Leave it in Drive would be my suggestion. 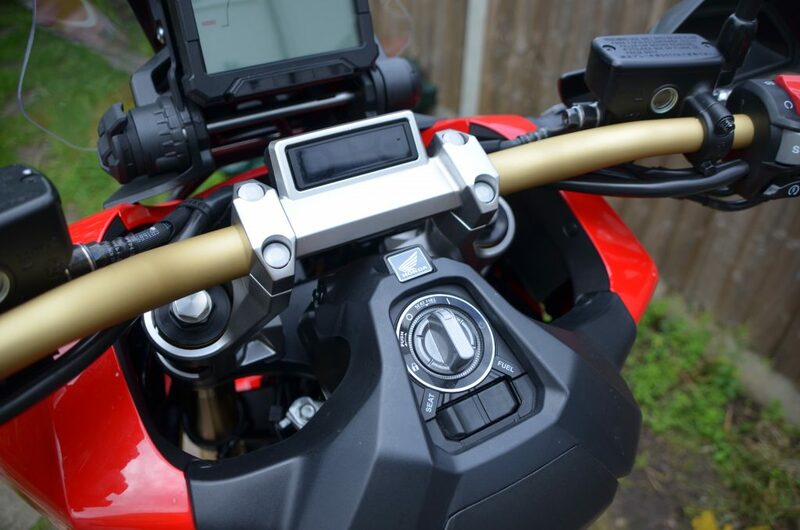 DCT operation is same as on Africa Twin and NC750; Neutral, Drive, Sport… then a button to toggle between auto and manual with up and down buttons on the left hand control unit. In terms of performance the 54 bhp X-ADV feels oddly more sluggish than a NC750 (which only weighs 8 less at 230 kilos). Maybe it’s the riding position that doesn’t give the same sense of speed, or maybe that the engine in this test bike was low mileage and still needed bedding in. You would describe the X-ADV as brisk but not much more. Having said that it’ll sit all day at high motorway speeds, top out at about 110mph and achieve economy figures of around 70mpg, even when ridden reasonably hard. Fuel capacity isn’t exceptional at 14.1-lites, but with such good economy it should be able to manage over 200 miles to a tank if ridden frugally. Plenty of range for most trips. As well as the new swingarm, the X-ADV also gets new 41mm upside down front forks with adjustment for rebound and preload, whilst front brakes are radially-mounted Nissin calipers taken from the Africa Twin, fitted with twin 310mm discs. The rear shock is now adjustable for preload. 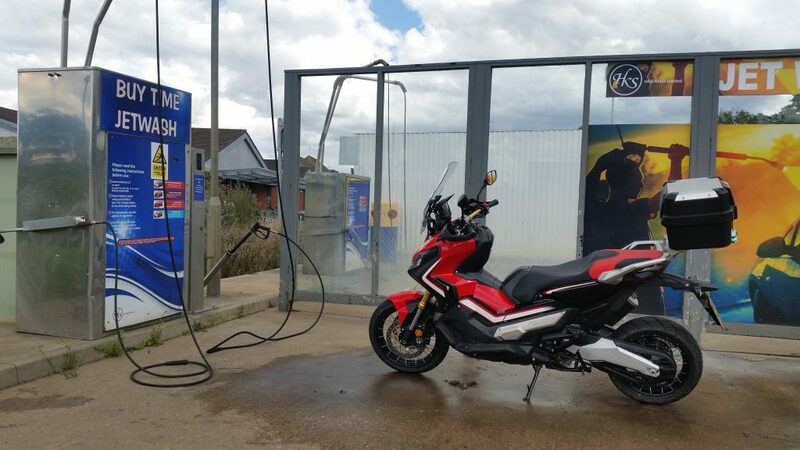 It’s a big step up from the equipment on the NC750 and and Integra and goes part way to justifying the extra £2150 the X-ADV costs over the DCT equipped NC750X and the £1270 over and above the price of an Integra. The bike certainly handles well – better than you were imagining – with quick turn in and a supple but controlled ride. I definitely noticed the improved quality of the suspension over the NC750, which can get out of shape quite quickly, especially along bumpy roads. Nice wide bars appear to be taken from the Africa Twin and give good leverage for tipping into tight turns. It is a strange sensation initially having your feet up in the air out in front of you, but you do get used to it. The X-ADV’s longer wheelbase over the NC750X (1590mm plays 1525mm) also makes it a surprisingly stable bike at speed and overall the handling is a lot of fun. I also liked that the rear brake was handlebar mounted in the position you would usually find the clutch. This worked well with the DCT gearbox, allowing you to trail brake the rear when doing tight manoeuvres on partial throttle, almost using the back brake as a clutch. 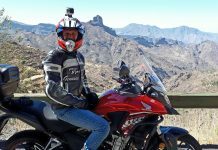 It’s a feature that would work well on the DCT equipped Africa Twin, which can be a bit tricky to manoeuvre at slow speeds, trying to feather the throttle or use your right boot to drag the rear brake. The set up on the X-ADV is preferable, with a discreet pull on parking brake tucked away inside the right fairing cowl. The uprated brakes of the X-ADV also work well, with good stopping power and effective – and possibly a touch oversensitive – ABS, especially on gravel surfaces. It is a shame you can’t disengage ABS, particularly at the rear, as that would make for a lot of fun in the dirt, especially with the bike’s inherent stability at low speeds and that hand operated rear brake lever. 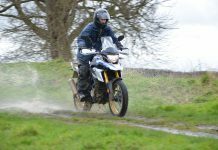 Traction control isn’t an option on the X-ADV, so at least you can spin up the rear for a dramatic gravel road take off, whilst on road the moderate performance is unlikely to catch you out on a wet corner. 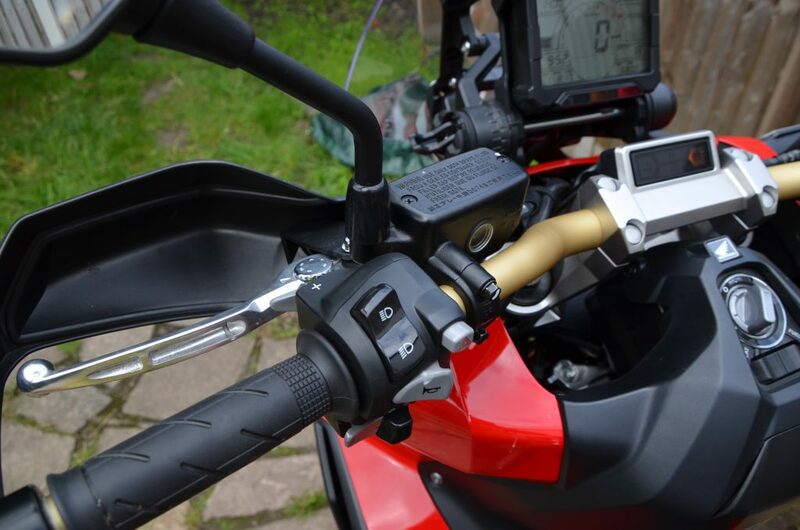 Hand operated rear brake is much better for slow speed manoeuvring than Africa Twin’s foot brake. Having taken the bike on a 300 mile round trip to the Peak District I did find the seat uncomfortable after an hour or so in the saddle, though I imagine a bit of that is getting accustomed to the riding position, which places more pressure on the backside and less on the feet than the adventure style of bike I usually ride. I didn’t get to test the rear seat for pillion space, but it is nice sizeable pad and probably makes the X-ADV better suited for two up riding than the NC750. As long as the pair of you can get on. During my time with the bike I explored a few familiar dirt trails. The biggest limitation for off-road riding is the fact that it’s a bike not designed for standing up on. 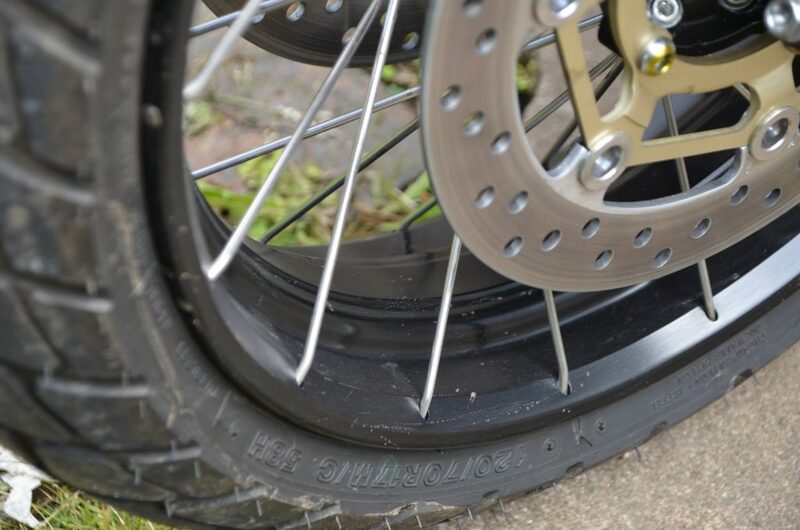 Your feet on the narrow running boards are too far forward and anyone of any normal height won’t be able to stand up straight enough to get any real control, or weight over the front of the bike. It leaves you in a crouching position that feels unnatural and precarious. 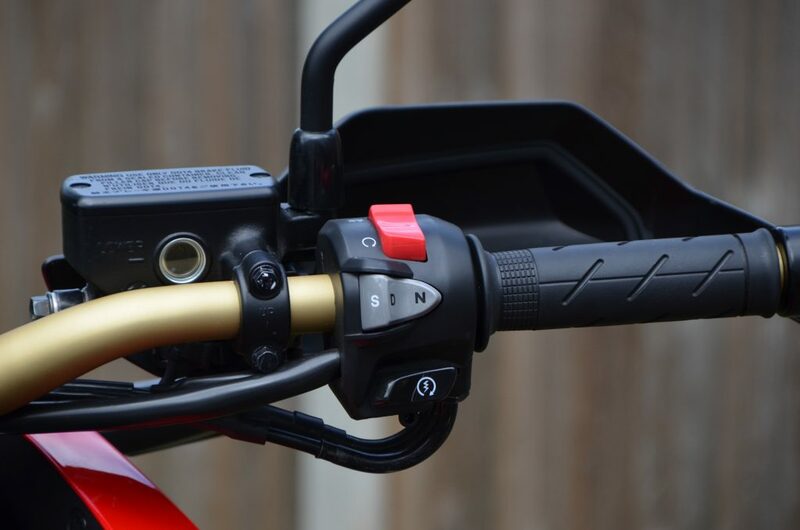 Honda do make aftermarket off-road footpegs that bolt in the position where the footrests would be on the NC750. 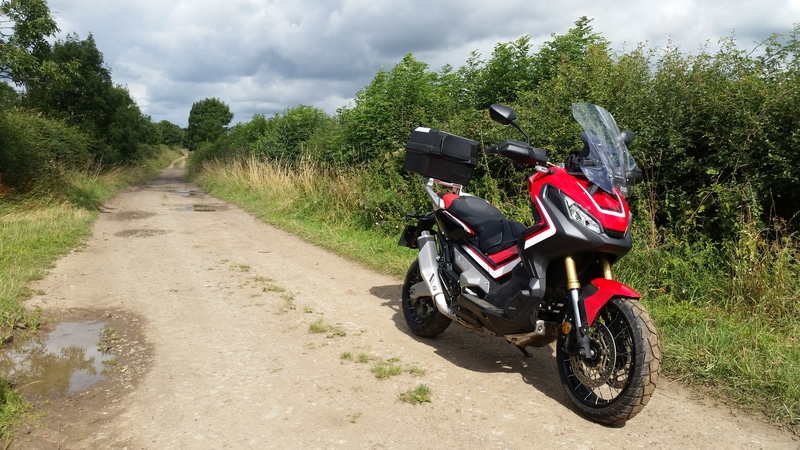 A Honda rep said these made the bike much ‘better’ in the dirt, which I could well imagine, although I’m sceptical to believe they’d transform it into something that was truly designed for more spirited off-road riding. Having said that, I watched bike journalist Chris Moss push the bike around on gravel with a lot of confidence, not to mention speed, so if the surface isn’t too taxing and the rider brave enough, you could definitely have some fun on the X-ADV. Just don’t drop it. During my time with the bike it rolled off the stand at standstill. It broke the hand guard, brake lever, scuffed the running board and dented the heat shield on the end can. You can get optional crash guards for the running boards, which are probably going to be a good idea. It does attract a lot of attention, just not all of it good attention. Tubeless rims are a nice touch. Shame they couldn’t have done the same for the Africa Twin. 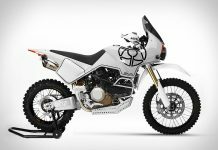 Honda labels the X-ADV as a city adventure bike and I think that’s about right. It’s at its best in short, tight environments, and even if you never take the bike off-road the longer travel suspension still makes it ride the bumps and potholes of modern roads than much better than a regular scooter, or NC750X for example. 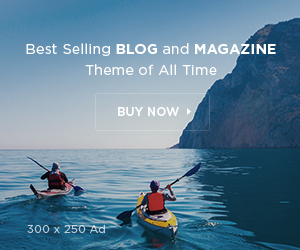 Is it worth the extra money over the NC750X? Probably not, not in practical terms, but the X-ADV does have a prestige and a presence about it, not to mention the superior quality brakes and suspension. I did at times feel a bit silly on the X-ADV. I was conscious of its showy graphics and its blurred relationship between bike and scooter. Some other bikers didn’t know what to make of it. I think you need to be a confident character to ride a X-ADV, because people do look, and will pay it some interest, positive or otherwise. The question is whether it’s really answered the question of a scooter being used as an adventure bike. I look at the figures for the Suzuki Burgman 650 or Yamaha T-MAX 530, and wonder if the X-ADV has really added anything over those two bikes. The Burgman in particular has over twice as much underseat storage space than the X-ADV, and then there’s maintenance free belt drive that would be a blessing on the long hauls. 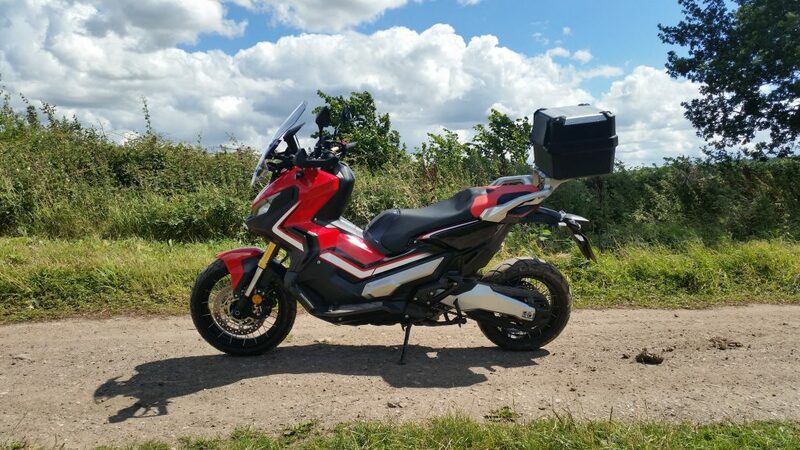 Even the Integra – the X-ADV’s foundation block – is arguably more practical for a big trip, for the fact that side panniers can be fitted to it, whereas the X-ADV only takes a top box. I’d probably prefer the Integra’s key ignition over the X-ADV’s key-less as well, but then the Integra wouldn’t ride as well over the bumps and wouldn’t have the ground clearance, so it’s all a much of a muchness, and down to what you need from a bike. I do think there’s room for an adventure scooter and in a way Honda already makes it in the form of their 50cc Ruckus or Zoomer scooters that are proper bare bones and sturdy go anywhere vehicles, just lacking a bit of refinement and an engine that would allow the bikes to cover a bit more distance and at greater speed. Stick the old XR400 engine in one and that’d probably work a treat (and also potentially get more people interested). Attempting to weigh up the X-ADV pragmatically and objectively is never going to work. It’s not a bike that adds up on paper. To some people it’ll never add up at all. For them it’s always going to be too expensive, too gaudy, too lacking in purpose to make it a proper adventure bike in the way historically we’ve imagined an adventure bike (knobbly tyres, big front wheel, cheap to buy, simple to fix). But if you accept if for what it was designed as – a bike to use all week on the city commute and to then head off on the weekend with a bike capable of taking you along the path down to the beach – then it makes more sense. It’s probably never going to be someone’s only bike. 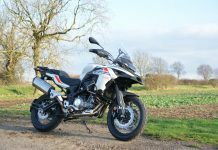 I imagine most will be bought as a second bike – something to complement a GS or Africa Twin because ultimately those bikes are more versatile than the X-ADV is ever going to be. It’s a shame it’s not easier to get on and off. It’s a shame those off-road pegs don’t come as standard and it’s a shame it’s not as practical as a proper large capacity scooter, but you still have to give credit to a company for putting their head on the block and building a bike they must have known was never going to make them much money, or even sell in any volume. It takes a bit of guts to build a bike like that. You could say it takes a bit of an adventurous spirit. 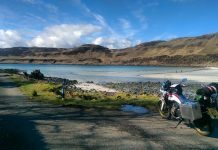 Ultimately, the X-ADV is not the bike for me. It’s not a bike I would buy with my own money. But that doesn’t mean it’s not a bike for someone out there, and in all honesty, the more you ride it, the more it does start to make at least some sense. Tubeless rims are a nice touch. Instruments hold a lot of information but at least the speed reading is clear. Screen adjuster dial is the lever on the left of instrument base, spring loaded and usually operable with one hand. 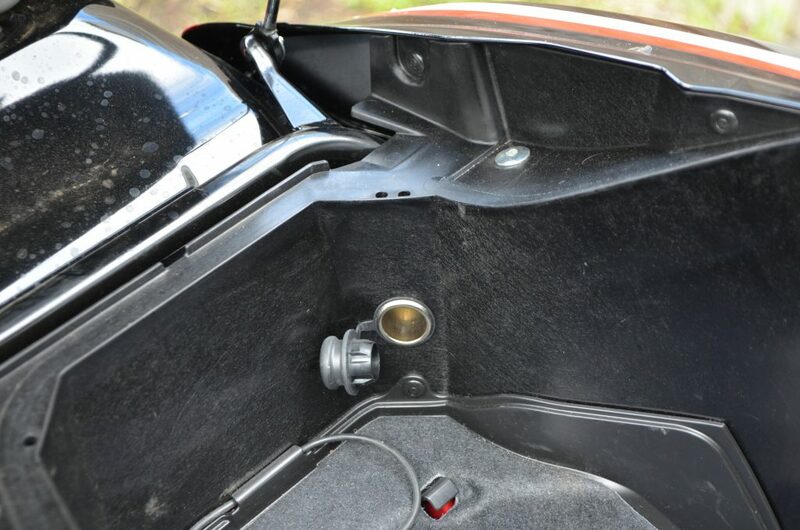 Toggle in the centre of the cowling turns the bike on and off, as well as a third position which allows you to use the slightly flimsy rocker switch below to either open the fuel cap or seat release. Previous article£8500…. on a bike, or on a trip?